Brett Kavanaugh has been an Associate Justice of the Supreme Court for over a week now. Here’s a recap of events since his October 6 Senate confirmation vote. By some measures, Kavanaugh is the least popular nominee to make it to the Court. Kavanaugh’s 50-48 confirmation vote tied Justice Clarence Thomas, who was approved 52-48 in 1991, for the record number of “no” votes for a successful nominee. Kavanaugh also received the fewest “yes” votes of all confirmed Justices since Mahlon Pitney, whom President William Howard Taft nominated in 1912 and the Senate approved by a vote of 50-26. Kavanaugh’s 2-point approval margin was the second smallest in history for an approved Justice. Senators approved Stanley Matthews by a single vote, 24-23, in 1881. 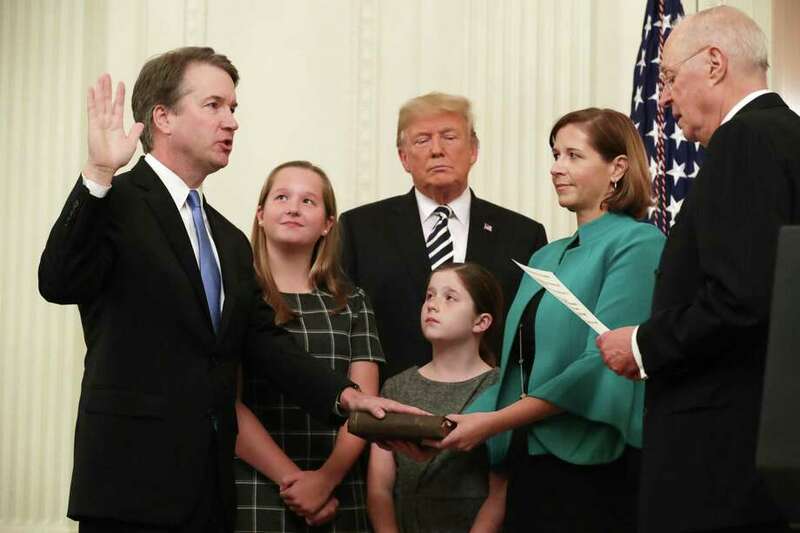 Once he got the votes he needed in the Senate, Kavanaugh then moved on to his oaths of office. First, was the judicial oath, which retired Justice Anthony Kennedy, whose seat Kavanaugh would now occupy, administered to his former clerk during a private ceremony the night of his Senate confirmation vote. Next was the Constitutional oath, which Chief Justice Roberts administered. Then, two days later, President Trump hosted a ceremonial swearing-in at the White House, where Justice Kennedy again administered the judicial oath. Trump apologized to Kavanaugh and his family “for the terrible pain and suffering” they had “been forced” to endure during the confirmation process. Kavanaugh gave a speech in which he said he had “no bitterness” over the confirmation. He also said all four law clerks he hired were women, a Supreme Court first. “I’ve worked hard throughout my career to promote the advancement of women,” Kavanaugh said. Kavanaugh was on the bench the following day. The first case he heard was Stokeling v. United States, which, like the other two cases the Court heard on his first day, involved the interpretation of the federal Armed Career Criminal Act. The newest Justice jumped right into his job. When the nine Justices emerged from behind the chamber’s red velvet curtain, Kavanaugh took his seat at the far end of the bench next to Justice Kagan. The two Justices laughed and talked until the argument began. Chief Justice Roberts paused at the start to welcome Kavanaugh, wishing him “a long and happy career in our common calling.” Once arguments began, Kavanaugh quickly joined the questioning. With Kavanaugh now installed on the Court and predictions that the Democrats might take the House in the upcoming midterm elections, some of those who opposed his appointment are talking about the possibility of an impeachment proceeding against him. An impeachment would require a simple majority vote in the House or Representatives. But removal from office is highly unlikely since it would require a two-thirds majority in the Senate, which Democrats will not have in the near future. Some Democratic operatives are even looking past the midterms and talking about the impeachment of Kavanaugh as a 2020 campaign issue, Axios reports. A big question now is what effect Kavanaugh’s confirmation will have on next month’s elections. Many are predicting that the confirmation will motivate women to turn out at the polls for Democrats. President Trump said earlier this week that he thinks the allegations against Kavanaugh were a “hoax” and will help turn out voters for Republicans. This post was written by ISCOTUS Fellow Bridget Flynn, Chicago-Kent Class of 2019, and edited by ISCOTUS Editorial Coordinator Matthew Webber, Chicago-Kent Class of 2019, and ISCOTUS Co-Director and Chicago-Kent Faculty Member Christopher W. Schmidt.